Donguibogam Village, Sancheong-gun, Wednesday 11 September, 5pm. At Korean expos, the emphasis is not on the looking. It is on the experiencing. You have to immerse yourself, to touch, to feel, to try something out. At the Sancheong International Traditional Medicine Fair and Festival, then, it was no surprise when the organisers, who had come across a charming little tale from ancient China of the power of herbal medicine pilloq to extend life, decided to see if they could recreate the pillow for expo visitors to try out. “A long time ago when I was 85 years old, I was very senile and almost dying. My hair turned white and many teeth fell out. By the way, an ascetic told me about how to eat only jujubes with water, refraining from eating grains and how to make a mysterious pillow. “You must put 32 medicinal materials inside the pillow. 24 among the 32 medicinal materials are good for your health, and they represent 24 solar terms, while the other 8 are poisonous, and they correspond to 8 winds. After I slept some time using the pillow, I became younger again. White hair got black, and new teeth grew out. I became strong enough to walk as long as far as 120km a day. When looking at the old man’s face, the Emperor thought that he looked like a man in his early 50s. The Emperor asked his neighbours if what he had said was truth. They all said that it was true. The Emperor had his men make a pillow following the old man’s methods. The Emperor, however, could not stick to refraining from grains and drinking water instead. It takes around 100 days after you begin to use god’s pillow for your face to become glossy. In a year, many diseases afﬂicting you are cured one after another with your body emitting fragrance. In four years, white hair becomes black, new teeth grow out, vision and hearing become better. It has been said that only a generous and respectable can pass on the secret prescription. Emperor Wu granted the old man a roll of silk as a prize. The old man, however, hesitantly held back receiving the prize and said, “The relationship between Emperor and subject is like that of parents and children. When a child has heard truth, it is natural to tell the parents about it. Your Majesty, therefore I am afraid I cannot allow myself to receive your Majesty’s prize. At the same time, I am not a kind of person who sells the truth. I just dare to want to tell your Majesty about this because you like benevolent behaviours.” Emperor Wu, then, granted the old man many kinds of medications as prizes. On May 5 or July 7, go to the mountains and cut down an Oriental arborvitae for making a pillow. The pillow should be as long as 34cm and as tall as 13cm. The inner part of the pillow should be carved out to leave a cavity. The capacity of the cavity should be as much as 22 liters. Then, make a lid for the pillow. The lid should be made of heartwood of Oriental arborvitae. The lid should slide for opening and closing, and ﬁt the guiding grooves well. Next is to make holes in the lid. The holes should be as large as the size of hulled millets. The holes should be made in three lines. Each line should have 40 holes totaling 120 holes altogether. 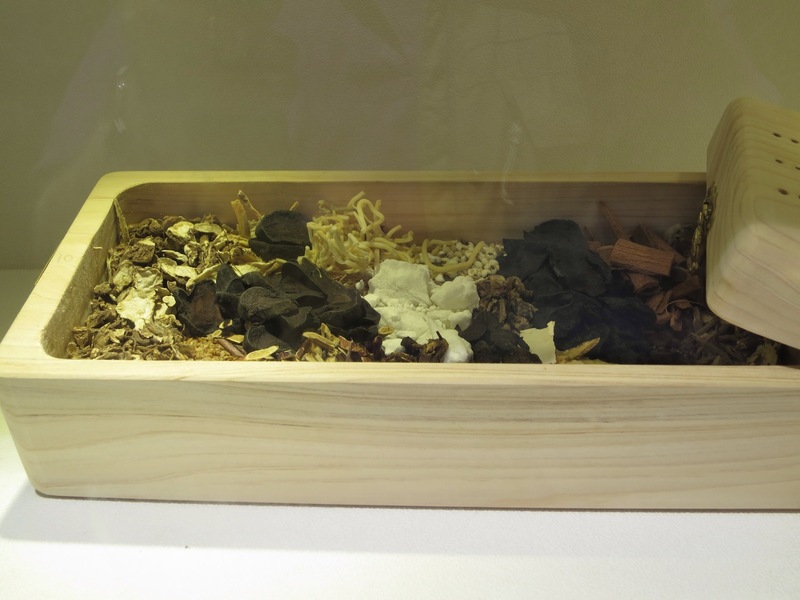 There are 24 medicinal materials which correspond to 24 solar terms. They are cnidium officinale, angelica gigas, angelica dahurica root, magnolia denudata, asarum forbesii, atractylcodes macrocephala koidzumi, Chinese lovage, magnoliaceae, madder, cinnamon, dried ginger, ledebourialla seseloides, ginseng, balloonflower, poria cocas wolf, jingshi, cistanche deserticola, carduus crispus, biota seed, coix lachrymal-jobi var. mayuen, tussilago farfara, cynanchum atratum bunge, zanthoxylum bungeanum, and ligusticum chuanxiong. The other 8 are poisonous, and correspond to the 8 winds. They are: aconitum carmichaeli, aconitum carmichaeli debeaux, veratrum nigrum, gleditsia sinensis, erigeron canadensis, ettringite, pinellia ternate, and asarum. A pillow needs 37g of each of these 32 medicinal materials for its cavity: cut the stated quantity of each of the medicinal materials into slices and put them in the cavity of the pillow with poisonous materials placed above. A pillow cover should be made of cotton cloth. Needless to say, we had to try it out. Combined with the soothing music, the fragrance of the wood and the herb mixture was very soothing. I haven’t noticed my one or two grey hairs recovering their original colour, or any teeth growing back – yet – but then I only lay on it for five minutes rather than the required few years.